You all know the early adopters. They all want to get it first. And now they are screwed. Not because the product wouldn't be "finished", but because they just outsold them to resellers. I'm infuriated. I feel screwed. 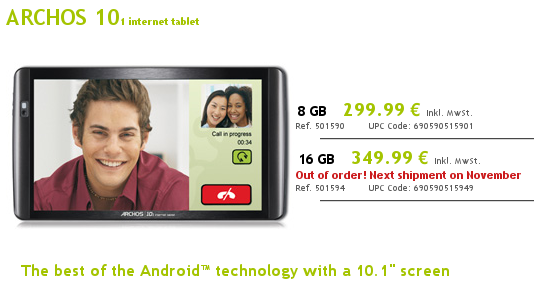 I watched EVERY day several times the Archos store if the pad is available for preorder. Nothing. It always said "Available soon". Today morning, like always, I checked the store while having breakfast and nearly choked my cereals. It says "Out of order! Next shipment on November". A quick googling showed that a big electronic market selling this now. Some big stores have like 8-10 pieces. But not in my area. Not only that. On the others, it's already sold out. I did not get a information. So the ones who wanted it most, now screwed and left alone, while some people bought it and mistake them with iPads or so. It's a shame. Archos, what are you doing?